Welcome to 2014! As I looked back on my lack of posts in 2013, I felt utter disappointment at how uncommitted I have been to myself and my readers in the past 12 months. In contrast, my friend Claire decided to take on a Photo a Day project for her blog Claire Can’t Stop Talking. This kind of project takes commitment, and so I thought I would ask her a few questions about her project and maybe this would help inspire other aspiring photogs and bloggers along on their project for this first day of 2014. When you have finished reading, please check out her blog! Enjoy! 1. Why did you decide to take on the “Photo A Day” project for your blog last year? It all started when I was looking through all the photos I had taken during my first year working away, and I realised I take photos every day and then never show them to anyone or do anything with them! It was nearing the start of a new year and I thought, why not take this project on and put some of these photos to good use! Plus, my blog was getting a bit dusty, so this was a chance to post some more on it and share a bit more of my life with my friends and family. 2. Was it hard coming up with ideas for the photos you took? Some days it was a bit of a struggle, especially if I hadn’t done anything out of the ordinary, I’d just been at work all day or something. So on those days, I would usually end up with something I’d call ‘from the archives’ – a picture I’d taken on that date in a previous year, or I’d have to try to take a quick selfie to post – because once you get a couple of hundred days in, you can’t bring yourself to skip a day! 3. Many of your photos involved your friends, family and colleagues. Did they take much convincing to participate in your project? Not at all! Most people didn’t mind having a quick picture taken (as long as I got their good angle! ), and then once I was further through the project, my friends and family were more aware of what I was doing. So when I said I needed to take my photo for the day, they were happy to be a part of it. Some of them were especially keen, and would ask to be in the pictures or they would start coming up with ideas of pictures they could take for me or things we could do together. A few of them have even decided to take the project on themselves in 2014. 4. Do you have a favourite amongst the 365 photos you posted? There are too many to choose from! Some of the photos celebrating things that happened on that day in earlier years were great because they took me back to those times – meeting the cast of the Lord of the Rings films in New Zealand, which was 10 years ago now, and also a lot of the photos from my trip to the US in 2012. But in contrast to those bigger things, I also love some of the photos with my friends and family that were taken specifically for this project, since I don’t get to spend as much time at home with them these days, and doing this gave me a great excuse to take photos when I did catch up with them. I love the first and last pictures of the project too, I think they are great book-ends to the year. 5. Was there a particular moment for a photo you took that you would like to relive? 6. Do you have any advice for anyone else who might want to take on a similar project? Go for it! And tell people about what you are doing, and why you are taking the pictures. At first I wasn’t really telling people, I think because I thought they might think I was a bit crazy. But since I was posting the links to my blog on my Facebook and Twitter accounts, it didn’t take long for people to find out. It is much easier to get great photos for the project once people know and are happy to get involved and aren’t wondering why you always have your camera or phone out. Put your own twist on it too; there aren’t any concrete rules with these things so use your photos and posts to celebrate special occasions, relive memories or pay tribute to things that are important to you. 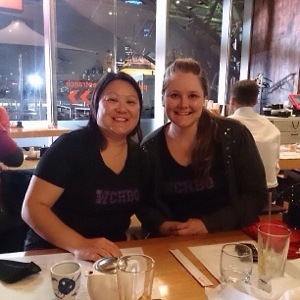 This entry was posted in Interviews and tagged blogging, photo-a-day on January 2, 2014 by Valerie Leung. I’m glad you liked it. I have another one coming up in the next day or so which I hope you will love. It’s an interview with someone I am a big fan of and it is an exclusive. Stay tuned!